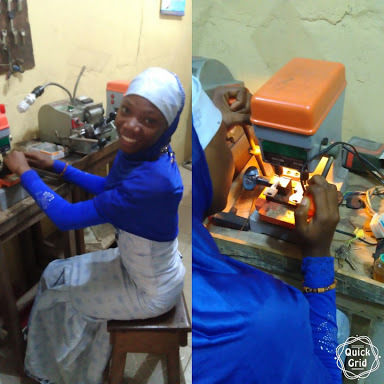 Fatimah Apesin, a 500 level student of Psychology in the University of Ịbadan uses returns from the business of cutting keys to see herself through school. Within minutes, she expertly fashioned out an exact copy of a key, so you don't have to cry about your missing key(s). According to her, 'key cutting is a very lucrative business and I enjoy doing it.' While commenting on her choice of business, Miss Apesin says that she chose it because it's not a saturated venture like makeup, hairdressing, fashion designing and other typical female vocations.